"YouTube Tools" consists of a set of useful tools to enhance user experience on youtube.com. At the moment, you can stop YouTube from auto-buffering videos and stop YouTube from displaying annotations by default. For the complete list of supported extensions please read FAQ 3. What is "YouTube use Flash Player" extension and how does it work? "YouTube use Flash Player" extension forces YouTube to use Flash player instead of the default HTML5 player. Flash player usually performances better especially on low-end devices. To switch back to the default player, simply disable the extension. Note that this extension does not provide any UI. To make sure extension is functional, refresh a YouTube page and when the player is fully loaded, right click on the player. You should see Flash's context menu. What is "YouTube No Buffer (Stop autoplaying)" extension and how does it work? YouTube No Buffer (Stop autoplaying) extension aims to stop YouTube from auto buffering videos upon a youtube page is loaded. The idea is to prevent YouTube from start buffering videos when a new tab or window is opened. Note that this extension is not going to stop YouTube from playing next tracks in the active window. It only works when a page is refreshed. So to stop YouTube from loading video segments on an already loaded page, please hit the refresh button once. When a player starts loading the video file, it will also be allowed to play next tracks. There are no aggressive stopping methods in this extension as those methods prevent you from watching playlists. Note that the new permissions requested in the version 0.1.5 are to stop auto-playing for embedded YouTube players. What are the tools and how can I get them? Always asks YouTube to prefer Flash player over the default HTML5 player. In Safari, you need to activate Flash player for YouTube website. Please follow this guide to active Flash player. Do not let YouTube from displaying ads inside the player. Note that this is not an adblocker and hence is very lightweight. This extension only asks the player not to load ads during the play. Prevents YouTube from buffering video content until it is manually requested. This is useful to prevent multiple YouTube tabs from buffering videos simultaneously. You can add an exception to the playlists (useful when multiple tracks are being played in sequence like a music player). Do not allow YouTube from displaying annotations over the video player. Users still can ask for annotations by turning them on from the settings menu (annotations are going to be disabled on the next page load). Forces YouTube to stream in high definition quality. The extension forces pre-defined HD quality when the player starts playing. If for any reason YouTube changes quality to a lower resolution, the extension forces the HD quality one more time. It is possible to allow YouTube to select between multiple HD qualities from the options page. Adds a stop button to the player. By pressing this button, YouTube player will unload itself. There will be no more data fetching when the player is in the stop mode. Automatically pauses YouTube player when the page is hidden and resumes it when the page is active. Displays a tiny progress bar on YouTube’s video player even in the fullscreen mode when the default progress bar is hidden. This is useful to know the progress and loaded percentages when watching long videos. The height of the permanent progress bar is configurable. This extension requires “cookies” permission to be able to set the height of the permanent progress bar in YouTube page as a cookie entry. Searches for lyrics of the playing track when the user requests them. Basically, the extension adds a new button to YouTube player next to the settings button. When this button is pressed the extension search for lyrics based on the video title and displays the lyrics in an embedded section below the player. In contrast to the other similar add-ons, there are no constant background checks for finding lyrics when you are browsing YouTube. This extension adds a new button to the YouTube player to repeat a single track repeatedly with a second delay. The extension is disabled by default. If you would like to repeat the current playing track click the button once to change the color to white which means that the extension is enabled. You can also enable the repeater by appending “&repeat=true” to the address of the YouTube page. So if a page with this argument is bookmarked, YouTube player will start in the repeater mode. Note that this extension does not work in the playlist mode. If the button is clicked in this mode, the extension offers to switch to the normal playing mode. a player button to switch the YouTube player to picture-in-picture mode which pops the player out of the page in a floating window (on top of all other windows). The picture-in-picture mode is useful to have the player visible while browsing other tabs. Is "YouTube use Flash Player" extension compatible with "YouTube No Buffer (Stop autoplaying)" extension? No, Flash player is loaded once YouTube config file is populated and hence there is no easy way to manipulate this player. Is it possible to stop an already buffered YouTube video using YouTube No Buffer (Stop autoplaying) extension? Yes, just hit the refresh button and wait for the player to fetch arguments one more time. What is "YouTube No Annotations" extension and how does it work? YouTube No Annotations aims to turn annotations off by default. YouTube by default displays annotations when a video uploader added them while uploading a video. 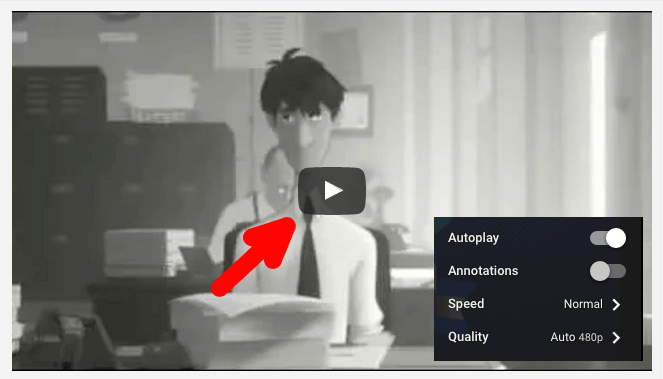 Since these annotations are usually very distracting, using YouTube No Annotations extension you can ask the player to stop loading them by default. Still, you can turn them on from the settings gear button though. Can I still see annotations when using YouTube No Annotations extension? Of course. Just enable annotations from the gear button. This extension just requests YouTube player to not loading annotations by default. You still can enable them using the gear menu. What is "YouTube in HD" extension and how those it work? YouTube in HD automatically requests YouTube to switch to an HD quality when a non-hd quality is selected. This extension can force YouTube to play in high definitions by requesting HD quality when YouTube switches to a non-HD quality. Is it possible to have all these settings in one extension? Well, there are some extensions out there that offer this, though I prefer to keep them isolated to have better maintenance when a single feature is malfunctioning. This way you can just install tools that you are actually using. Note that these extensions have about zero impact on your browser performance. Well, the actual permission that I use is "storage". This permission is required to store internal preferences of these extensions. Unfortunately, the description that is shown to the user is somehow misleading. Note that you can always verify permissions that an extension is using by downloading the package and extract it into a local directory. Open "manifest.json" file to see the actual list of permissions. For these set of tools, there should be no data sending to an external server at all, neither there should be any access to local data. They only configure YouTube player before page load. That's it!